Depositing with a credit card at the online casinos has long been the most favorite method for both the gambling operators and customers alike, but this trend is slowly changing. Due to the many problems the payment processors employed by the online casinos face these days and the subsequent higher fees for processing credit card transactions, the online casinos are slowly moving away from the credit card deposit as the top choice for funding one's player account at the gambling websites. Naturally, the fact that these days the online casinos rely less and less on the credit cards and more on the many ewallets available, stems not from the desire of the online gambling operators to cut down on credit card deposits, but from the fact that it has become harder and harder in the past few years for processors to work on credit card transactions involving online casino and gambling entities. And with the recent decision by MasterCard to block any credit card transaction that could be going to an online gambling company, whether coded as such or not, is viewed as yet another stick in the spokes of the once smooth depositing method. Of course, there are many processing companies willing to work with the online casinos and process their credit card transactions, but that now comes at higher cost for the gambling operator, often a few times more than it used to be just a few years ago. But contrary to the popular belief, the fact that the online casinos are relying less on credit card deposits is actually a good thing for the players. For once, the ewallets rarely charge and if they do - just a small amount, the player to fund the ewallet account and never charge for transferring the ewallet money to the online casino. In recent years the credit card processors have moved far away from the USA and Western Europe, which leads to big fees charged from the banks issuing the credit cards themselves, as they often treat the transaction as a cash advance. 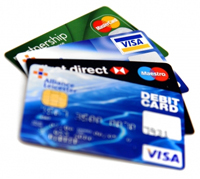 On another side, the need for credit card in order to play at the online casino is now completely eliminated. Millions cannot afford to have a credit card and not all banks offer debit cards with a logo from one of the big credit card companies. But with the move towards the ewallet transactions, players can now comfortably and easily transfer funds from their bank account directly to the ewallet of their choice. So after all the forced decision upon the online casinos to look for depositing methods alternative to the credit cards is not as bad as it seems on first look. Of course, it will take time for the millions of gamblers to warm up to the ewallets as a preferred depositing option, but once they realize how easy it is, the online casinos will begin to recover the volumes loss during the transition. Check with your favorite online casino for list of depositing options and ewallets the company works with for easier transactions in the future.